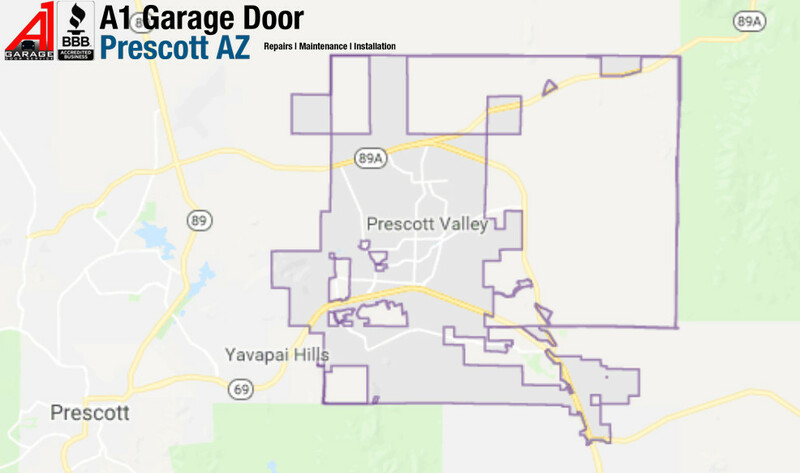 If you’re in need of garage door repair Prescott Valley AZ services, we have experts ready to respond quickly. If your garage door is noisy, shaky while opening, or otherwise not opening at all, we are ready for the job. We have been servicing the area for decades and pride ourselves on our ability to deliver speedy and specialized services. We stock all the garage door components and equipment that we’ll require to get your garage door working like new again. It doesn’t matter if you need brand new rollers, insulation, garage door springs or a garage door opener, we have all the parts from the biggest brands ready. Aiming to upgrade your home or building with an all new garage door? We’ve got plenty of options in stock at wonderful pricing. We are mobile and always available, so contact us to get your garage door fixed today! We at A1 Garage Door Prescott understand that you’re busy with everyday life, so we promise to help make the process of fixing your garage door fast, easy and painless. We know you expect the best, that’s why every one of our mobile technicians are entirely licensed to complete work in Prescott Valley. We instruct our technicians fully in installation, repair service, & maintenance for many months before they can perform work on by themselves. From modest services like torsion spring substitutions, to total door installations, the goal will be to provide you with service which you will tell your friends and family about. So don’t delay, give A1 a call today!